Historic New England recently secured a grant from the Getty Foundation as part of its Keeping It Modern initiative. Keeping It Modernfocuses on conservation challenges associated with the modernmaterials that Walter Gropius and hiscontemporaries introduced into the built environment in the mid-twentieth century. 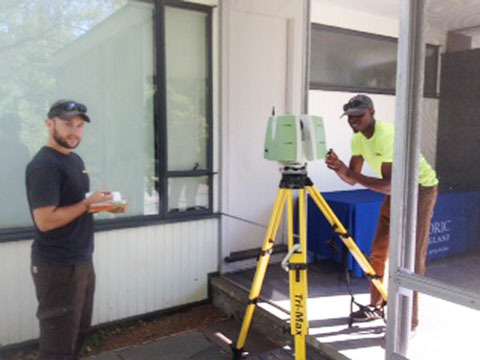 The project at Gropius House in Lincoln, Massachusetts, uses 3-D laser scanning to provide Historic New England with a set of current conditions plans and elevations. It will also provide a chance to offer interpretive 3-D animations. An architectural conservator recently visited the property, and will develop plans for cleaning of acoustical plaster, repair and stabilization of specialty glass, and analysis and planning for addressing mildew growth on the exterior siding. This work continues through the fall. Keeping It Modern is part of the Getty’s strong overall commitment to Modern architecture, as demonstrated by the Getty Conservation Institute’s Conserving Modern Architecture Initiative (CMAI), the extensive and growing architectural collections of the Getty Research Institute, and the 2013 Pacific Standard Time Presents: Modern Architecture initiative, which focused on Los Angeles’ Modern heritage. With these combined efforts, the Getty continues to advance the understanding and preservation of twentieth-century Modern architecture.